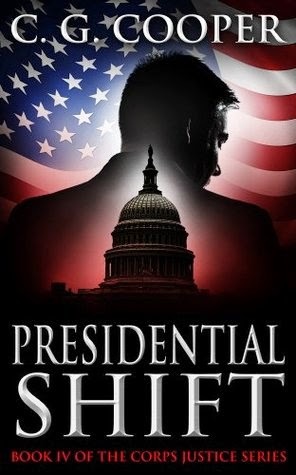 Presidential Shift by C. G. Cooper is the perfect weekend read if you’re looking for a bit of escapism from the grind of real life. It’s the fourth book in the Corps Justice series although, given that it is the first one I’ve read, I was able to enjoy it as a standalone read. There are some references to incidents that have gone before and relationships have obviously developed throughout the series but none of this impeded on the flow of the story. The novel is driven by political intrigue and chicanery and centres on a company called SSI which is manned by ex- service personnel. The lead character, whose father founded the company, is a former Marine named Cal Stokes and he is hired by the President to investigate corruption within the US government. Events take a more sinister turn when two attempts are made on the First Lady’s life and Cal and his SSI colleagues become caught up in a domestic terrorist plot that leads them to a group of white supremacists. The main cast of characters are convincing and the banter between them believable. Some of the relationships had obviously been forged through events in previous novels which made me want to read more. My curiosity was particular piqued by Senator Brandon Zimmer, Stokes’ former foe who is now his good friend. The narrative is fuelled by action with lots of twists and turns and there is a surprising twist at the end which adds an extra punch to the story. If you enjoy losing yourself in ‘24’ style adventure then this will be your kind of thing.